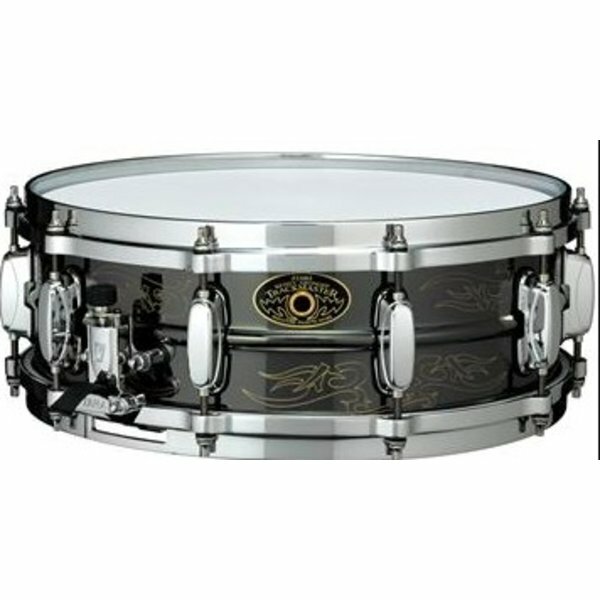 The shell on the Tama 5" x 14" Kenny Aronoff 'Trackmaster' Signature Brass Snare Drum features black nickel plating, with patterns engraved to highlight the underlying brass in an artful style. 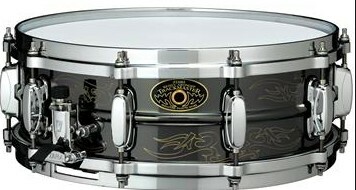 The brass mellows out the aggressive nature of metal snare drums, making this a pretty warm drum. The 5" depth gives this drum lots of versatility - tune it up higher for a bright sound or down for a tone with a little more oomph. Die-cast hoops lock the tuning in and hold there very strongly, despite your best rim shot efforts. This drum comes equipped with Evans G1 Coated and Snare Side heads.